Bringing the Best in Digital Business Cards! Get your contact information right on your customers phones with your personalized Digital Business Card. Customers will not have to look for your cards to contact you anymore with your information right at their fingertips. A simple, powerful, and affordable all-in-one complete solution Digital Business Card. Helping you to increase your customer interaction and helping you converting them into a possible team member. 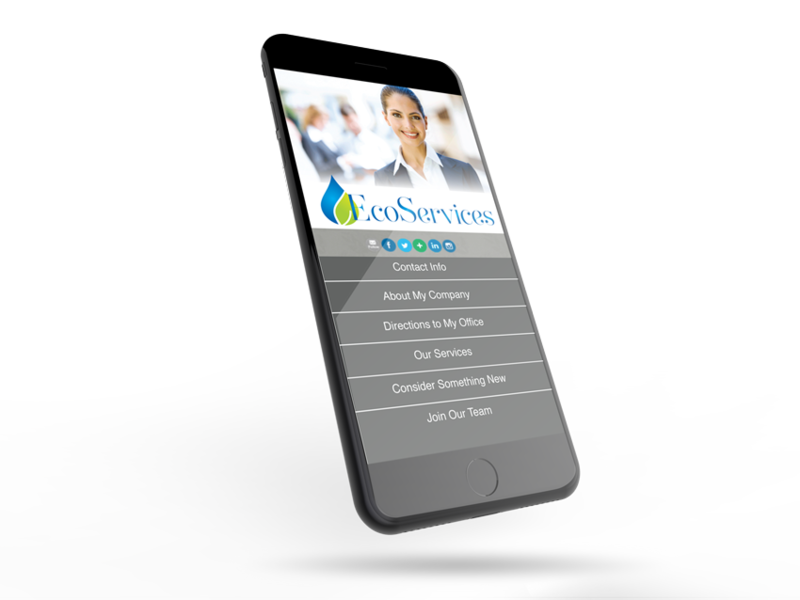 App like icon that will be on the home screen of smart phones with your company logo. Header banner - Send us your header/banner picture or have one of our designers will create it for you. *Additional Cost for a custom header/banner. Social Media Toolbar - link your site to your Facebook, Twitter, Instagram, Snapchat, etc. Contact Info Tab - Your Name, Address, cellphone number, email and online store will be listed here and there will be a hyperlinked for quick access. About My Company - You can highlight features or products about the company. We can add a product catalog or a video. Directions to my Office - embedded map of your business/office. Our Services - Information on services that are available to your customers. Consider Something New Tab - This is the Marketing or Opportunity tab to highlight your company's vision or any information that will be given to possible prospects.It includes a video of your choice from YouTube/Vimeo. Join Our Team Tab - Digital form that your customer fills out when they are ready to join your team or if they have additional questions. *The annual fee will be deducted every year unless you decide to cancel at least 15 days prior to renewal. Fully featured with no obligations. Cancel anytime. Powered by SmartWebApp4U. Want a site like this? Click here.